The skeletal muscles comprise the muscles that are fixed to the skeleton or - in a broader sense - that are responsible for the movements of the body. Just as the myocardium, they belong to the striated muscles. Comment: The term "skeletal muscle" is somehow misleading, since it also comprises some muscles that are not directly fixed to the skeleton, such as the muscles of the tongue, the muscles of the larynx, and parts of the mimic muscles. 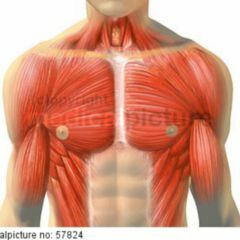 Furthermore, you differentiate between the origin of the muscle and the muscle insertion, which has a "sinewy" or "fleshy" connection to the bone. 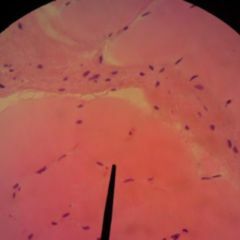 A skeletal muscle can have several surfaces of origin - also at various bones. Another macroscopic characteristic of the skeletal muscles is their pennate structure. You can differentiate between simple and double pennate muscles. Skeletal muscles that work in the same direction, i.e. that complement each other in their effect, are called agonists. When they work contrarily, they are called antagonists. In order to give the skeletal muscles of the human body a more didactical structure, you can divide them into different muscle groups according to topographic and functional aspects. A skeletal muscle consists of the actual muscle fibers, which are responsible for the contraction, and supportive tissues. On their exterior, the skeletal muscles are covered by a layer of coarse connective tissue, the fascia. 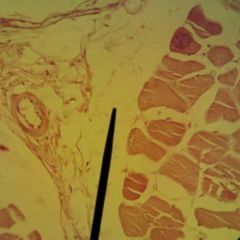 From there, some connective tissue offshoots draw into the muscle, which further divide it into fiber groups. They are also called septa. 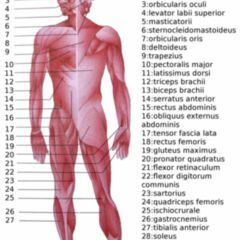 Thus, a muscle can be divided into several hierarchical functional units, whereof the sarcomer is the smallest functional unit of the muscle. 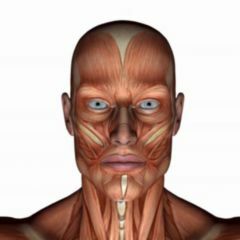 The layers of connective tissue that surround the muscle fibers or fascicles unite ate the muscle heads into the tendons of the muscle, which insert on the bone. They also contain the nerves and blood vessels that supply the muscle. The main components of the skeletal muscles are the contractile proteins actin (3% of the total weight of the skeletal muscle) and myosin (7% of the total weight of the skeletal muscle), as well as the Z-lines, which are connected to the actin fibers. The distance between the Z-lines is called sarcomere. Around 100mg per gram of skeletal muscle represent the contractile proteins. Skeletal muscles are responsible for the statics of the body and the motor function. The operating principle of the skeletal muscles is described in the sliding-filament model. The control of the skeletal muscles is managed via motor nerves that transmit electric impulses via the release of acetylcholine into the motor endplate. The title should be "skeletal muscles" and not "skeleton muscles". It should also be used consistently throughout the text.